﻿ Novotel Danang Premier Han River, Da Nang | FROM $119 - SAVE ON AGODA! Have a question for Novotel Danang Premier Han River? "Excellent service and superb cleanliness." "The 2 bedroom apartment was rather nice though, had good views of Han river and the staff was very nice and knowledgeable." "Corner 2-Room apartment has a master bedroom with fantastic view of the Han river and city, and aGreat location." "Very nice view and nice room service." 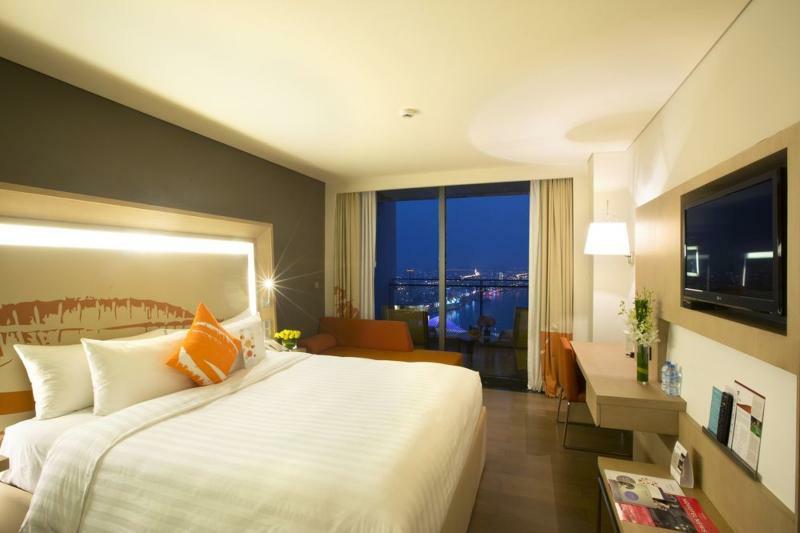 Located in Danang’s central business district on the West Bank of Han River, Novotel Danang Premier Han River is a perfect hotel venue for both business and leisure travelers. This hotel is in the vicinity of popular city attractions such as Camel Club and Han River Swing Bridge. With its convenient location, the hotel offers easy access to the city's must-see destinations. The facilities and services provided by Novotel Danang Premier Han River ensure a pleasant stay for guests. Guests can make use of on-site features like shops, dry cleaning, and a concierge. The hotel features 323 beautifully appointed guestrooms. The hotel offers recreational facilities such as a fitness center, massages, and outdoor pool to make your stay truly unforgettable. With an ideal location and facilities to match, Novotel Danang Premier Han River hits the spot in many ways. Please enter your preferred dates of stay and submit our online booking form to make a reservation. "We decided to treat ourselves to a nice hotel, and wow!!" Please be informed that Superior room type only accept maximum occupacy of 2 person including children. 한강을 내려보는 뷰와 위치는 좋다. 다만 좁은 숙소는 외부 환경과 달리 다소 답답하다. 호텔 내부 부대시설과 루프탑은 매우 좋다. The view and location of the Han River are good. However, the small accommodation is rather stuffy unlike other environments. The inside of the hotel and the roof top are very good. Good hotel although could do better by informing guests of construction work via letter. Having said this they gave me a free ride to the airport. Hotel seemingly does not have own parking area and have to ask nearby office’s parking area and have to wait to get their approval on parking lot. Elevator from basement 2nd go up lobby is from office building . Hotel with 5 star grade but has no one to take care customer ‘s luggage. We have carried our luggage from basement 2nd up to lobby then take to room . Room & facilities mostly fine but breakfast restaurant with poor staff’s service who not take care to clean up empty plate, fork etc...when table was full. We have to request staffs to clean it up. Sound insulation is not good, at night the dance club sound is terrible and noisy and we can not sleep well. I dont understand why hotel let the Sky36 open music super loud like that. The location is very good. The staff is very helpful , friendly and efficient. The installations are beautiful. Our room had an amazing view of the river and the Dragon Bridge. Breakfast is huge and varied. Recommended for a luxurious experience in Da Nang! The location was pretty good to access anywhere of Danang city and also it was near to international airport. We can go easily to 'SKY 36' that was in the Novotel Danang. Breakfast quality was quite good, there were many kinds of Vietnamese local food. Room condition was also fine, we can enjoyed han-river view. Most of all, hotel staff was so kind , tried to best to help us. We had a corner suite on the 22nd floor with access to the Executive Lounge. We always find this option good value, attending afternoon teas and nightly happy hours. The breakfast in the Lounge is good, but the restaurant on the 4th floor has greater variety (although noisier!) Two suggestions for the Lounge : chill your drinks better/longer (or possibly turn the fridge up) and get a proper toaster. If you provide crusty loaves & baguettes, you need to provide a toaster that accommodates the thicker slices (not a toaster that only fits regular sliced bread!) Rooms were clean and bed comfortable. The room service menu was extensive and well priced. The front desk also provides currency exchange, but do it before 10am! Thanks for an enjoyable stay Novotel. We would recommend this hotel and will happily return. I think the hotels rooms have a better view than the apartment, but the apartments are more spacious and have a washing machine. So depends on what is more important. Service is good, but it gets a bit tiring during the check in when the staff keep asking if you want additional add ons or upgrades... maybe they get a commision. The hotel feels new and the rooms feel new too. Location. Near han River, most of the rooms facing the river, so quiet and peaceful. Balcony is huge! There are two big lying down chairs to enjoy the view anytime. That was a big attraction for me. No other tall buildings nearby, no interrupt. Many restaurants and cafes nearby. Clean and new facilities.. Brand new building. Breakfast was also very good. Cooked food and fresh noodles! Salad bar is extremely good. (many pickles and kimchi) Baked goods are decent too. Worth trying I tried spa two times, it made mu stay more pleasant. Very nice personal rooms with friendly staff. Also enjoyed some early bird discount :-) if you can, must try. All the staff English is very good no communication problems at all. Only 10 minutes from the airport, can stay for the first day or last day of your schedule. If you like the city, it's a good choice. We stayed in this new hotel for 2 nights. The location is great, as it is quite near to Han River. The room comfort and staff friendliness and service are excellent. However, the hotel rate is quite pricey as the quality is not up to 5-star level to me. The perfect hotel in the right area with fantastic views over the City from the rooms. The rooms are modern with all amenties, nothing to miss. Breakfast buffet is excellent and the staff performance just great. Also the pool (infinity) is right sized for a city hotel and a good place to relax after all the excursion around Danang. The room was clean, but not really spacious. But it's not a big deal. However, one thing I want to point out is that, yes they have a balcony and it's really big! But it's out of my expectation that there were no chairs or tables... Just a really plain balcony u can only stand there to look at the night view. We had a great stay, without a single negative point. The hotel is located in the center of the city, with convenient access to transportation, all rooms have a nice balcony/terrace with good privacy, fast internet access, and great views over the city, river, and sea! In-house services were great, from breakfast to express laundry and fitness center, and staff very efficient despite we arrived in the middle of a tropical storm! Will definitively come back again. Every aspect of this hotel spells quality - except the Room Service Breakfast. It took several minutes and two phone calls to clarify that I wanted my eggs 'poached'. That's exactly what I go; two poached eggs on a single piece of toast. They arrived without anything extra; plenty of butter, a plate, napkin but no extra toast and my wife's order of fruit, yoghurt and muesli arrived without the muesli! This was a very mean breakfast; coffee, juice, jams etc was all extra. Small things I know but very disappointing when you book into a renowned western style hotel primarily for the food!! We had been hanging out for a western breakfast after 6 months of travelling in Vietnam. Novatel - you should do better! The hotel service was just superb, from the minute you checkin to the minute you check out. Really enjoyed my stay. The hotel is very well located and has Sky Bar on the top floor which is the highest roof top bar in Da Nang. You can see the lights during night. They have good drink menu and nice vibes including dancers. The hotel also has a very nice swimming pool on the 4th floor with a pool bar. Highly recommend Novotel Danang Premier Han River! Great staff! Use Lounge!!! Cold swimmingpool! We had been motorcycling around Vietnam and Laos and ended up missing our flight out of Danang. We decided to treat ourselves to a nice hotel, and wow!! This did not disappoint!! The view from our room and balcony was magnificent, as was the view from the stunning pool. Staff were very friendly and helpful, and the breakfast perfect. Absolutely no complaints other than the fact that the time was too short!! This was our second trip to Da Nang, and there was no question we would stay again at the Novotel Danang Premier Han River. We love the location right on the river, and it is a pleasant walk to many things in the area. The hotel accommodations are excellent, the staff very nice and helpful, and the buffet breakfast one of the best I've ever had. The staff helped us schedule local tours and transfers to Hoi An, and we enjoyed the excellent pool and gym facilities at the hotel. Nice hotel with great amenities. Wonderful night view of bridge from balcony. Varieties of tasty breakfast.